It is based on an Italian novel, but echoes of the notorious Atlanta vegan baby starvation case ring throughout Saverio Costanzo’s mostly English language drama. 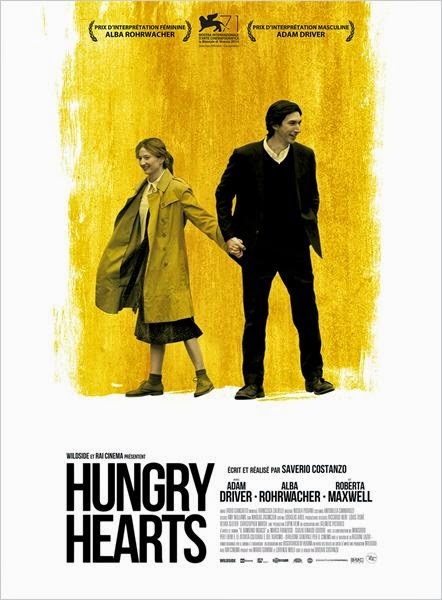 A new Italian mother parents too much with her intuitive feelings, ignoring conventional pediatric nutrition and medicine in Costanzo’s Hungry Hearts, which had its U.S. premiere at the 2015 Tribeca Film Festival, with a screening at the Montclair Film Festival soon to follow. Jude, an Upper Westside engineer, and Mina, a PR flack for the Italian consul, meet-cute, under slightly gross circumstances. Enjoy the scatological humor while it lasts, because there will be major friction in their married lives. There are ominous portents of trouble to come during her difficult pregnancy, but Mina’s manic New Aginess really starts to manifest in highly problematic ways when she starts imposing a strict vegan diet on the infant. At first, Jude is more worried about his underweight son’s persistent cold-like symptoms. However, when he finally sneaks the crib monster to a doctor, he is told the sniffles are “the least of his concern.” The boy is so malnourished, he simply isn’t growing. However, whenever Jude questions Mina’s dietary decisions, she takes it as a personal attack on her legitimacy as a mother and a person. Yet, some things should be said before it is too late. Hungry paints an alarming portrait of everyday extremism and the slow but steady evolution of conventional vegetarianism to reckless child endangerment. It springs some abrupt course corrections on viewers, but there are reasons for the sharp tonal shifts. While the jokey prelude seems like it belongs in a different film, it helps explain why Jude defers to Mina for so long. There is always love there, but it turns into something very dark and ultimately dangerous. Ordinarily, the nebbish Adam Driver and the pixyish Alba Rohrwacher would never look like a convincing couple, but cinematographer Fabio Cianchetti’s lens serves as a harsh leveler, ruthlessly focusing on and magnifying the imperfections of their skin. Frankly, in the case of Rohrwacher (who steamed up the screen in Soldini’s Come Undone) this is a much more complicated process, but she compellingly portrays Mina’s physical and emotional decline as she starts to shun direct sunlight and protein. It is a seriously scary transformation. In contrast, Driver’s Jude always seems to be a step behind the beat, for no good reason. Just for the record, Mina never says to him: “Hey Jude, don’t let me down,” which seems like an obvious oversight. Regardless, they often seem to nurse special resentments only possible through intimate familiarity. There are also brief but pitch perfect supporting turns from Medium co-star Jake Weber as the calm but concerned pediatrician and Roberta Maxwell as Jude’s concerned but not necessarily calm mother. Hungry is an honest and direct film, but the nearly two hour running time starts to feel punishing after ninety minutes or so. It is like the film is holding us hostage until we pledge to feed our future children healthy slabs of meat. Still, you can’t say it isn’t convincing on that score. Meat is good. The film is also quite good, despite a few stylistic excesses here and there. Recommended for fans of Italian cinema (in exile), Hungry Hearts screens this Sunday (5/3) at Montclair, but the Tribeca Film Festival had it first.